When you add an issue template to your repository, project contributors will automatically see the template's contents in the issue form body. Templates customize and standardize the information you'd like included when contributors open issues. 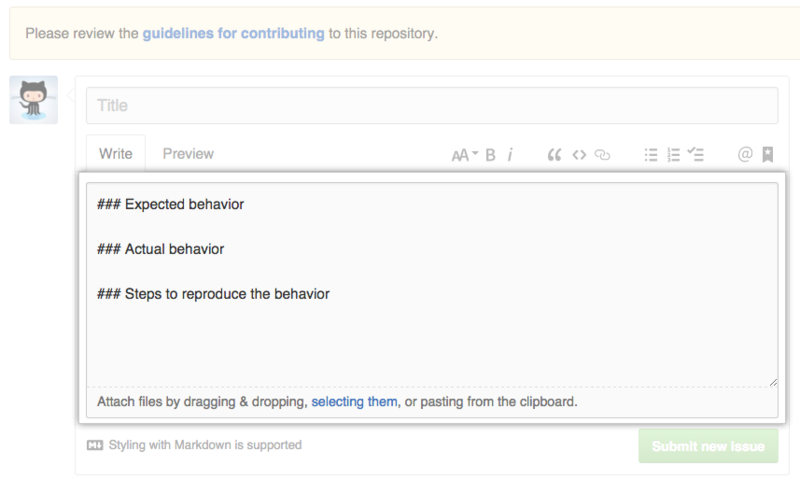 Contributors and users can use templates to create issues according to the repository's contribution guidelines. For more information, see "Setting guidelines for repository contributors." You can store your issue template in the repository's visible root or in a hidden directory called .github. Issue template filenames are not case sensitive, and can have an extension such as .md or .txt. Tip: You must create your template in your repository's default branch. Templates created in other branches are not available for collaborators to use. Above the file list, click New file. The name of your issue_template, such as issue_template.md, to make your issue template visible in the repository's root directory. .github/ followed by the name of your issue_template, such as issue_template.md, to store your file in a hidden directory.